I'd settle for a filter on that, but it seems like a more complete fix would be to add the filter with a default function hooked into it which would add post types with show_in_nav_menus = true to the list. nav-menu.php.diff.patch​ (645 bytes) - added by layotte 6 years ago. nav-menu.diff​ (735 bytes) - added by louisremi 6 years ago. 16828.diff​ (2.5 KB) - added by barryceelen 19 months ago. Working on a plugin now that is running into a similar issue. For first-time users of the nav-menu who have our custom nav menu activated, it will not appear on the nav menu screen (unless they select it). 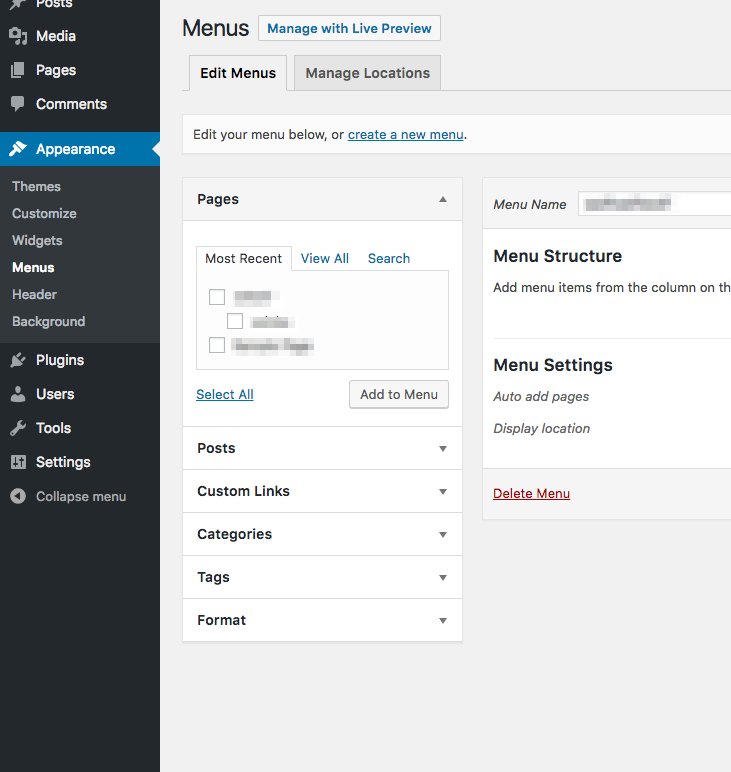 We should be able to set our nav menus as visible by default upon viewing the nav-menus.php page initially. #24256 was marked as a duplicate. My bug has just been closed as duplicate from this one. I came up with a patch similar to the one proposed by layotte but with a more specific name for the hook (because this feature is really specific to nav menus). Wouldn't it make sense for this screen to make use of the already existing ​default_hidden_meta_boxes filter? This threw me off for a bit after registering a custom post type. IMHO this limitation should be deprecated/removed entirely. The function was introduced in 3.0 with a new menu editor. The way the meta boxes were displayed at the time quickly lead to a very loooong page, even when there were only core menu items visible. Limiting the number of meta boxes shown made sense. This is not the case any more. The collapsed accordion does not cause a long page like it used to (subjective, I know), even if the core Tags and Post Formats (?) are not filtered out. It does however cause the need to document/support "How do I add menu items for custom post types registered by [insert plugin name]??". #41820 was marked as a duplicate.